Welcome to CoinParade! 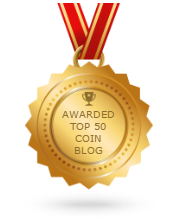 We have lots of great articles on coin collecting and the history of coins. Use our knowledgebase to research popular coins such as sovereigns, two-pounds or 50 pence’s. We have over a 1000 pages of information. Most of our content is about British coins, but we have articles on American, Canadian, Australian and several other countries. We occasionally write about investments, metal detecting and cryptocurrencies like bitcoin. The Midland Coin Fair attracts around 50+ dealers from all around the UK and is always on the second Sunday of each month. March/June/September/December are the 'Big' fairs, which have even more dealers. In 2005 it was the 400th anniversary of the Gunpowder Plot and the Royal Mint commemorated the event with a two pound coin. Although all of the Morgan Dollars have more value than their face value, the 1889 Morgan Silver Dollar has the most value and is the most sought after coin in the entire Morgan Dollar series. 2019 America the Beautiful Quarters is part of the America the Beautiful Quarters® Silver Proof Set series and was the 10th set to be released. Features Lowell National Historical Park, Massachusetts; American Memorial Park, Northern Mariana Islands; War in the Pacific National Historical Park, Guam; San Antonio Missions National Historical Park, Texas; and Frank Church River of No Return Wilderness, Idaho. The Farthing was a small British coin that was worth one-quarter of an old penny - 1/960th of a Pound. It's name derives from the Anglo-Saxon feorthing or fourthling, meaning fourth part. It was last minted in 1956. King Cnut the Great, better known to many as King Canute, was King of Denmark, England, and Norway. To commemorate the 1000th anniversary of King Cnut's ascendance to the English crown in 2017, the Royal Mint struck a gold proof five pounds piece (£5). In 2010/2011, four one-pound coins were issued by the Royal Mint to represent the four capital cities of the United Kingdom (London, Edinburgh, Cardiff, Belfast). This set contains all four coins, minted in gold proof. Here are a few other tidbits of gold lore. Once again, I'm going to concentrate on gold that is in waterways and river beds. Platinum is a dense, stable and rare metal that is more than ten times rarer than gold. There are a number of coins that contain platinum and it is often used in jewellery. Here are some interesting facts about this rare metal. Finding gold is not a matter of chance. Finding gold is a matter of understanding some physical properties of gold and how it interacts with its environment. In essence, it's playing Hide & Seek... with gold. One of many more fascinating aspects of America's early days regards the origin of the early United States silver dollar coin, specifically The Flowing Hair Silver Dollar. 1879 was a notable year for the Morgan Silver Dollar. The Morgan design was first released in 1878 and production was increased by using four mints in 1879. There were a number of varieties and a very special 'Schoolgirl' pattern dollar. Benedetto Pistrucci (1783-1855) was an Italian engraver and medallist who is probably most widely known amongst numismatists as the designer of the famous George and the Dragon image shown on the gold sovereign reverse. The Indian Head Cents, as coins, were considered as being one of the most popular 19th-century American series amongst collectors. Commonly referred to as the Indian Penny, the Indian Head Cents were officially introduced on the 1st of January, 1859. The Sixpence (half a shilling) was a British silver coin that was first minted 1551 and virtually continuously until decimalisation in 1971. Metal Detecting at the beach is a growing hobby around the world. Many people are purchasing metal detectors and "prospecting" local beaches, swimming areas and waterways. Here are some basic guidelines. Coin Grading is determining the condition of a coin. Condition is everything when two like coins compete for best price. Would you buy the MS 63 Penny or the VF Penny? The Morgan Dollar is a United States Silver Dollar named after its designer, George T. Morgan. These were made from 1878 to 1904, and then again, in 1921, just for that year. The $10 Indian Head Eagle gold coin, also know as the $10 Eagle, minted from 1907 to 1933, is considered to be one of the most beautiful American gold coins produced by the U.S. Mint. The first year the Buffalo Head Nickel (also known as the Indian Head Nickel) was minted was 1913. The coin was struck at each of the 3 Mints, Philadelphia, Denver and San Francisco.